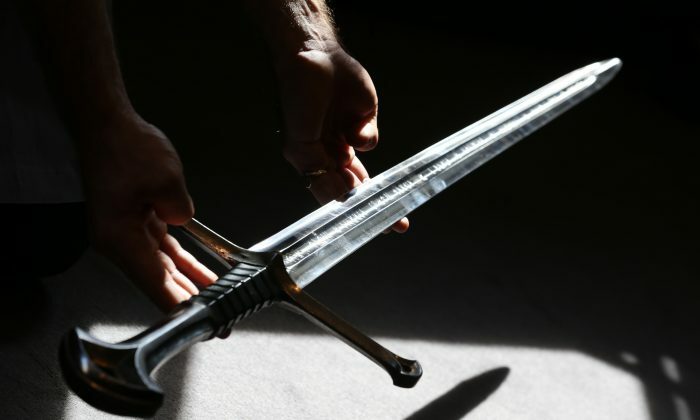 A 13-year-old Chinese boy has died after being stabbed with a classmate’s foot-long sword during a lesson. Guo Sheng was reportedly playing with the classmate who had brought the sword to school on Tuesday, Dec. 12. In CCTV footage, the classmate, who is known as Li according to Beijing Youth Daily, can be seen either throwing or accidentally projecting the sword toward Guo, impaling him in the back. Guo died shortly after the sword was pulled out of him, the Quan Feng Secondary School said in a statement, according to MailOnline. Staff at the school raised the alarm, but Guo was already dead by the time his parents arrived. Police, local government, and the school all regard the incident as an accident, but others disagree. According to the Daily Mail, his parents reportedly wrote on social media: “No one cared about my son and no paramedics could be seen. In the CCTV footage other children are present when Guo was stabbed. Chinese web users have been quick to question the events surrounding the stabbing, according to the Mail, which quotes several translated comments. “Obviously he was throwing the sword at him fiercely,” said one called MrMiTung. Other posts questioned how such young children could have brought a sharp weapon like a sword to school in the first place. 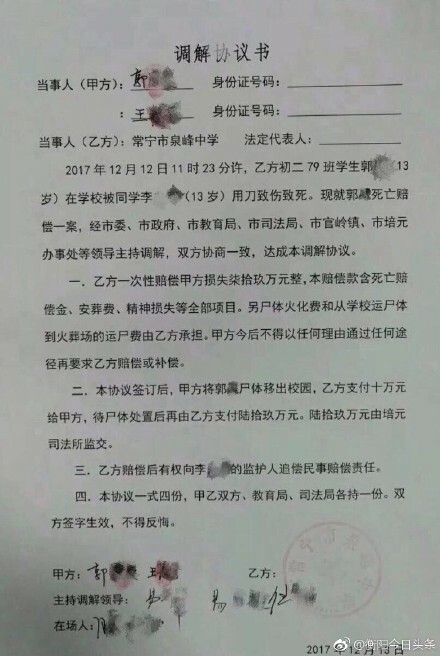 A screenshot has also emerged of a document that allegedly suggests the local government has agreed to pay 790,000 yuan ($120,000) to Guo’s parents as compensation. What do you think? Comment and share this article on social media.